WeGotSoccer’s EZKit Uniform page for Seacoast Express United is now available!! Please do not order your 2018/19 uniform package until you have received your NEW assigned jersey number from the Club. Assigned jersey numbers will be sent by club registrar. Click here to visit Seacoast United's WeGotSoccer's EZKit page. Orders that are placed with incorrect numbers or sizes may not be returned. Assignments will be specific by team, please do not assume your number will be the same as last year. Game uniforms will be used for both the 2018/19 and 2019/20 seasons while training kits change each year. Seacoast United and WeGotSoccer have released the 2018/20 soccer club uniforms! The home kit is the club's traditional maroon, while Nike's "Volt" kit returns as the away uniform. The training kit for 2018/19 is black with white socks. 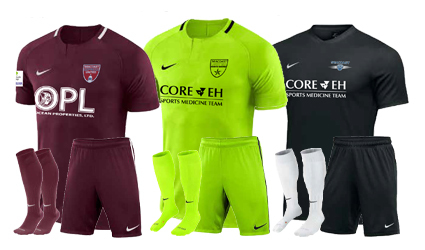 Click here for ordering information after you have been fitted and received your jersey number.